West Midlands Primary Panathlon hosted a special celebration to honour 2016 Birmingham Panathlon Outstanding Achiever Neve Allen. The 10-year-old, who was born with a congenital short left femur and hip dysplasia, defied doctors who feared she would never walk to compete in sports and win ballet and tap-dancing awards. Neve has had 10 gruelling operations on her hips and legs, and has even attended New Oscott Primary School in Sutton Coldfield in bed (after an operation), wheelchairs, plaster casts and on walking frames. 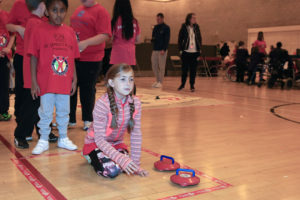 She was among 70 pupils from nine teams from a total of seven schools across the Birmingham area to compete in the Panathlon team challenges at Nechells Community Sports Centre on Monday. The icing on the cake for Neve was her school’s victory on the first day of the two-day contest. Fellow competitors watched and cheered as Panathlon COO Tony Waymouth re-presented Neve with her Peter Harrison Foundation Outstanding Achievement Award. She has also won the Stephen Sutton Inspiration Award in the Midlands Children of Courage Awards this year, after being nominated by Tony. Neve agrees that it is not in her nature to accept defeat and she has her sights set on becoming a Paralympian, after meeting five-time Paralympic wheelchair racing gold medallist Hannah Cockcroft when Neve joined the Coventry Godiva Wheelchair Athletics Club. Neve also plans to participate as a wheelchair athlete at the London Mini Marathon in April 2017. “My dad has a JustGiving website to try and raise money for a racing wheelchair, which can cost about £2,500, for me, as I have to borrow one at the moment,” she added. You can contribute to her appeal here. Lindsey McMahon – who runs the gross motor group for children with disabilities to access sport at New Oscott Primary, a mainstream school – said: “Neve is brilliant. She tries everything you throw at her and more. She always says she will have a go. Neve was born with a rare defect that means her left leg is 7cm shorter than her right. She has undergone operations at Great Ormond Street Hospital to lengthen her leg and reconstruct her hip and hip joint. After one operation she was in a cast from chest to ankle for eight weeks. Despite these obstacles, Neve has also competed in swimming galas, cross-country running competitions and completed numerous challenges for charity. She has raised approximately £3,500 for STEPS – a charity helping families like hers deal with lower limb children. Find out more about Neve’s courage and achievements in this video below. Another student in the West Midlands that deserves special praise is K’Marni MacDonald, who is at Calthorpe Academy. K’Marni was Panathlon’s runner-up for an Outstanding Achievement Award in Birmingham in 2016, but also won a St. James’s Place Children of Courage Award in October like Neve above. K’Marni has Global Development Needs, brain hernia, learning difficulties and hearing impairment. K’Marni started wearing special glasses/goggles at the age of 9 months to help him see, he didn’t walk until he was 2 years old and never spoke until he was 4 and half years old. K’Marni joined Calthorpe’s Panathlon team 2 years ago as the teacher saw it as a way of being part of the school. He was not one for change but sport allowed him to gain confidence and Panathlon has helped him do more. He has now taken part in Panathlon for these 2 years and got involved in other school teams as well. He is involved in the Boccia/New Age Kurling, cricket, sports hall athletics and also Ten Pin in the Deaf Panathlon. His favourite sport is football. Due to his vision, he dosen’t watch TV, so he has no football role models or watches games, he just loves to play. He can’t head the ball due to the brain hernia but he is now in the Calthorpe schools football team who play other teams, he goes to Aston Villa every 2 weeks for training sessions and his goal is to make the Aston Villa SEN football team. At the end of each school day his mother has to find a park, so he can be on his feet and practice with a ball – see the video below for an example. K’Marni is also now on the School Council, where they act as a sounding board for teachers and acts as a mentor for younger students just entering school.